I’m excited to finally have a plan for this patchwork piece. I love it when projects are basted and ready to be quilted! While organizing my fabric stash, I found some strips leftover from a jelly roll, so I decided I should make something with them. I’m not sure if I have enough time or energy to make a set of patchwork placemats, so I might just make a cute table topper for the season. 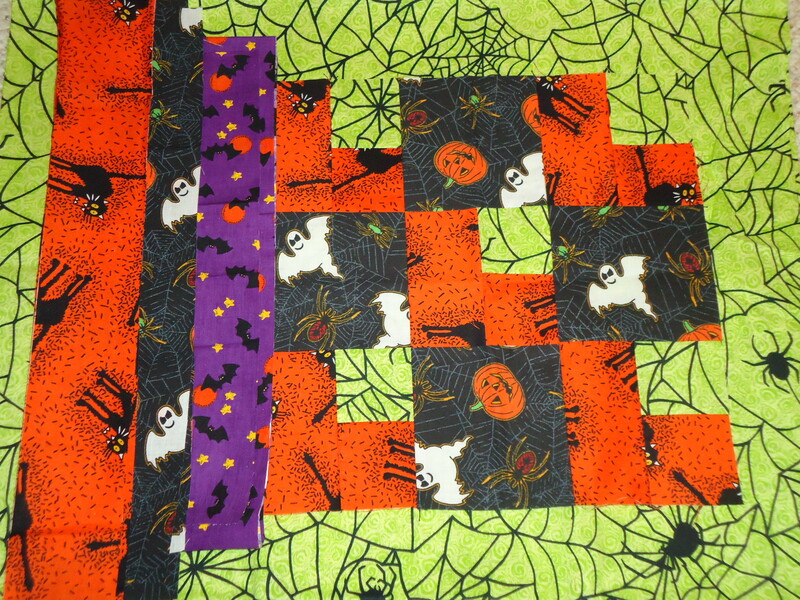 I also found this orphan block from my husband’s Halloween quilt, so I’m going to add borders to it for a pillow cover. I think he will really love that! I have a million other projects going on right now, and constant homework to be working on, so I shouldn’t be messing around with my fabric stash. I’m not good at setting aside time to use scraps, so I have renewed excitement with these new patchwork projects with leftovers I found! Your top quilt is so pretty – I love the combination of fabrics. Halloween/seasonal stash – oh goodness!! 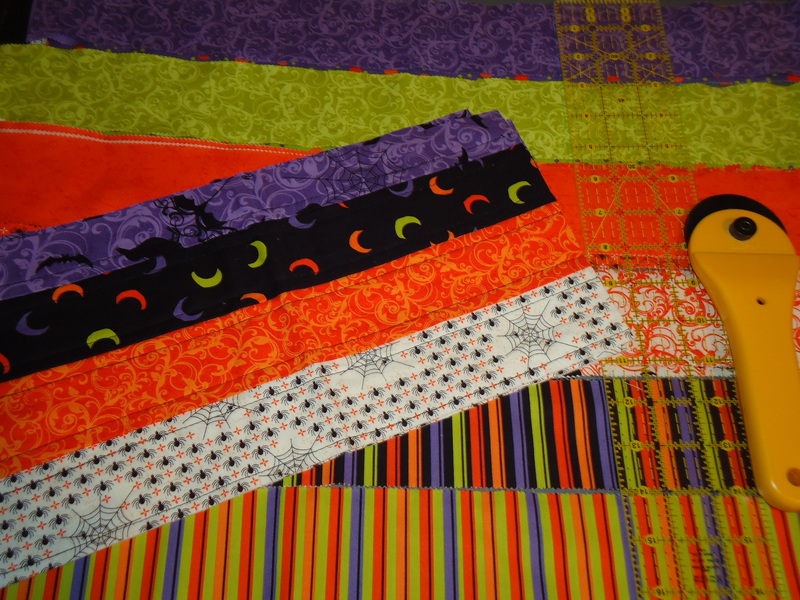 Love them too – I have seen so many inspirational Halloween quilts this year and I am definitely going to make one next year… those fabrics are brilliant. Great idea to make a pillow to match your husbands quilt! Looks like fun! I have a feeling you’ll keep things balanced just fine. Ooh, that orphan Halloween block is awesome. Pillow–good idea. And that purple just makes all the other colors just pop! The flowers and patchwork are so sweet-I can’t wait to see what you’re cooking up! AND look at you using your Halloween stash! I’m a Halloween lame-o. I will be doing exactly nothing for Halloween (much to my husband’s chagrin). I am so glad to see someone else use up there scraps I am very bad at it also. I am in the middle of trying to go thru and clean up and out some stuff and have found lots that need finished. Hope all is going well with your schooling. So much fun to use up scraps! Love making table toppers. p.s. Come on over and share your home-made halloween costume! Your Halloween project is going to be cute! I love what you have going so far. Perfect for the season. Keep your head up, hope you are having fun doing your homework. I never seem to buy any Halloween fabric but lately fabric designers have been coming out with some really cute prints. I may have to do a Halloween quilt for next year. Very pretty projects, looks like you’ve been busy! Hurray for scrap usage. A pursuit near and dear to my heart!!! You know, I often feel guilty for how much time I spend thinking about making projects. But tonight when I was doing a sink full of dirty dishes I was thinking just how mundane life would be without those projects. Or without the excitement the thoughts and plans those projects bring. It made me feel so much better about my creative pursuits. Does that make any sense at all??? 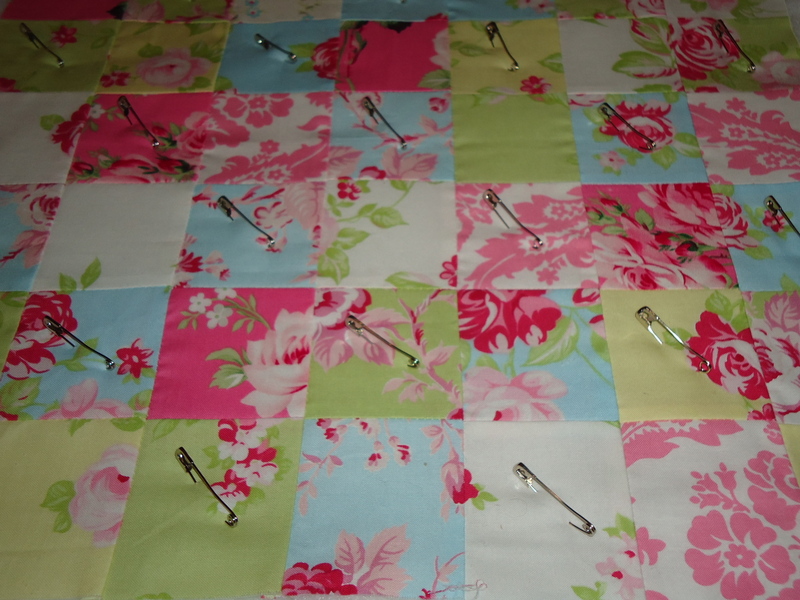 Love your scrap quilt – those fabrics are sweet:) Hope you manage to find a bit more time for sewing next week. It is always hard to get the perfect balance. It’s so great to find a perfect use for “stash” fabrics…looks like you have terrific ideas here for everything!